Black Friday has past, and so has Cyber Monday. But we know most guys won’t start their holiday shopping until the last minute leaving them desperately searching for the right gift. Sure jewelry is always a great choice, but we know what you like and what she likes aren’t always the same thing. In an effort to avoid the inevitable scenario where you get her something you think she’ll like, only to find it stashed away a few months later, we’re here to help. We’ve had the female staff select a few gifts we’re sure any lady in your life will enjoy receiving this holiday season. So for all the procrastinators out there, here is a guide to some gifts she’ll love, whenever you get around to it. One thing everyone loves is to be comfortable and cozy during the winter. What could be better than to gift that feeling in a piece of clothing every time they put it on? 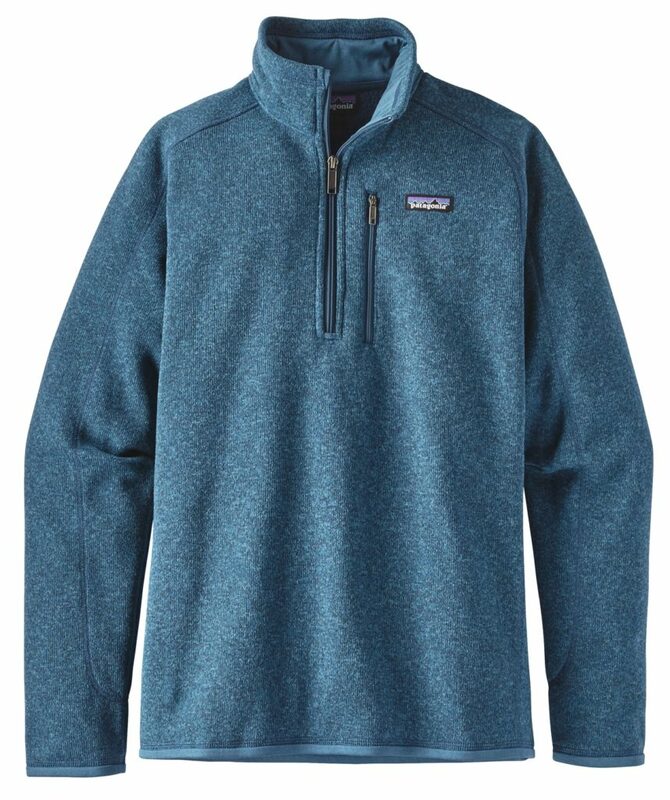 Look no further that the Re-Tool Snap-T Fleece pullover from Patagonia. Even just from the look of it, you know that it’s going to have you feeling like you back in bed under the covers. 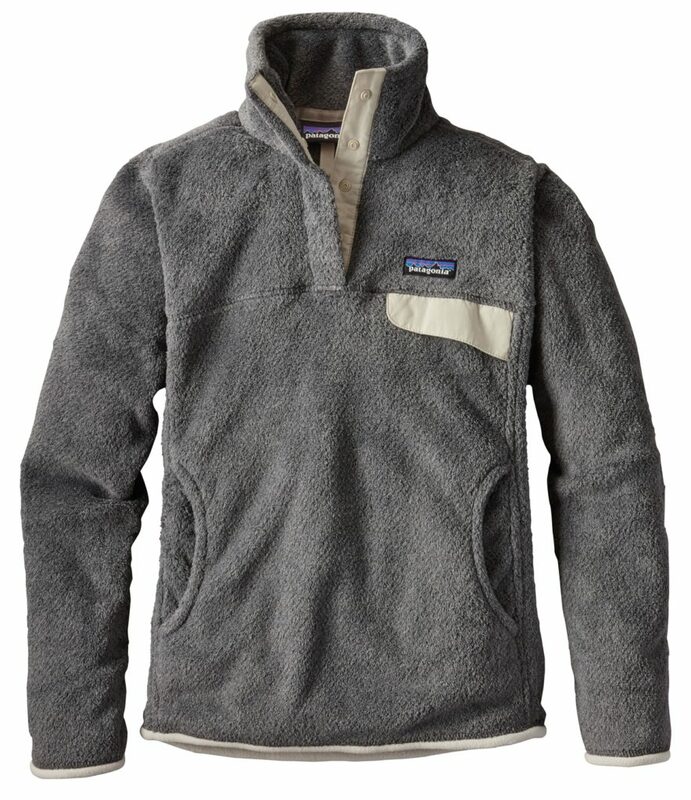 Its Deep-pile fleece of 51% recycled polyester keeps the warmth in with its extra-long fibers. The stand-up collar features double fleece, keeping your torso warm from the neck down. Complete with yoke and princess seams (we know you don’t know what that means) that add contour the fit. 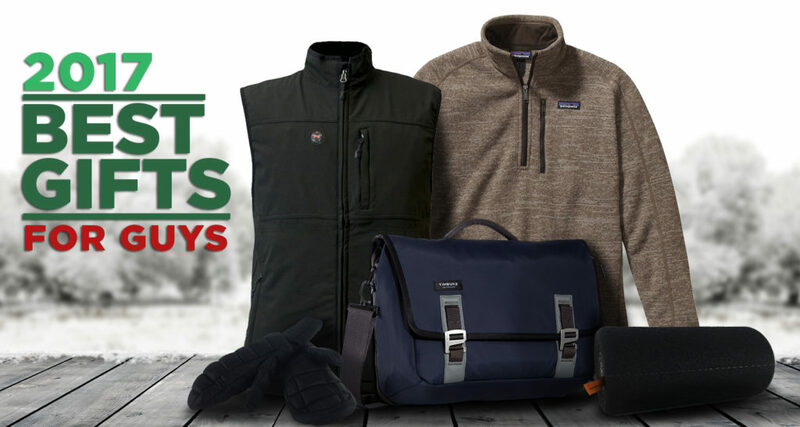 So if you are looking for a smart and easy decision, the Re-Tool Snap Fleece from Patagonia is lay-up when it comes to gift giving this holiday season. Now getting any women a pair of shoes is territory most men will steer clear of, and for good reason. But these Sorel Joan of Arctic Snow Boots are totally different story. When the deep of winter is here, and the snow is piling up, there are few boots that will stand up to the elements like pair of Sorels. Waterproof from top to bottom with seam-sealed construction keeps you dry and a removable felt lined inside keeps you warm. 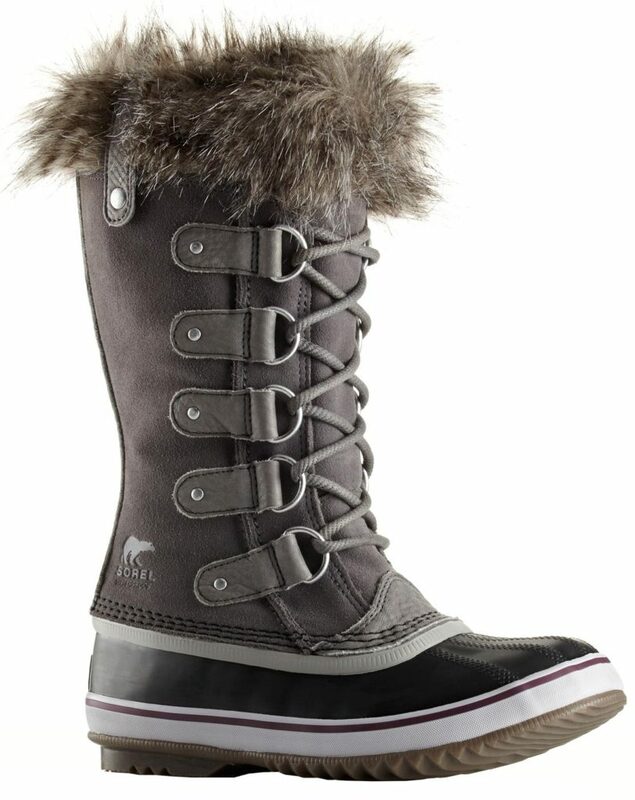 Faux fur cuffs keeps them fashionable and the vulcanized rubber outsole makes them functionable in wintery conditions. These are the perfect choice to get that, “Wow, I actually like these!” reaction. 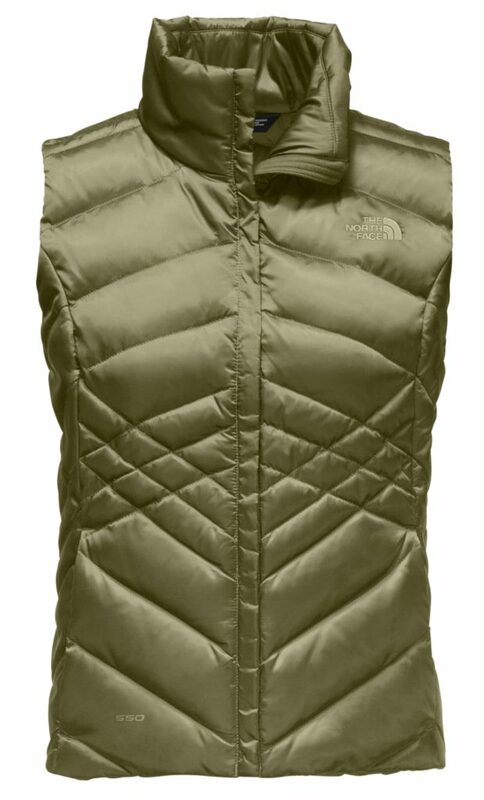 Keeping with the “Warm and Comfortable” theme, the Aconcagua Vest from The North Face comes in as another sure fire gift for her this holiday season. Soft to the touch and insulated with 550 fill goose down, this vest is perfect for those who want to keep their core warm on the go. The active fit means there are no restrictions, giving her mobility and a generous range of motion. This insulated down vest is ideal as a layer in the coldest winter months, or as an in-between as warmer weather approaches. This again is a great option for the guy who has left himself little time to decide. It may be smaller in size, but that won’t diminish its ability to make her happy on the morning of the 25th. The Spyder BRRR Berry hat is just the right size to make it a great stocking stuffer. With a hand knit construction and popcorn style stitch, you may be able to convince her you knitted it yourself! 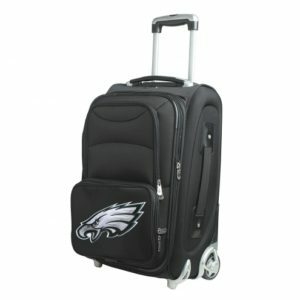 But a warm fleece liner and logo charm on the side will let her know that it was made by the trusted people at Spyder. 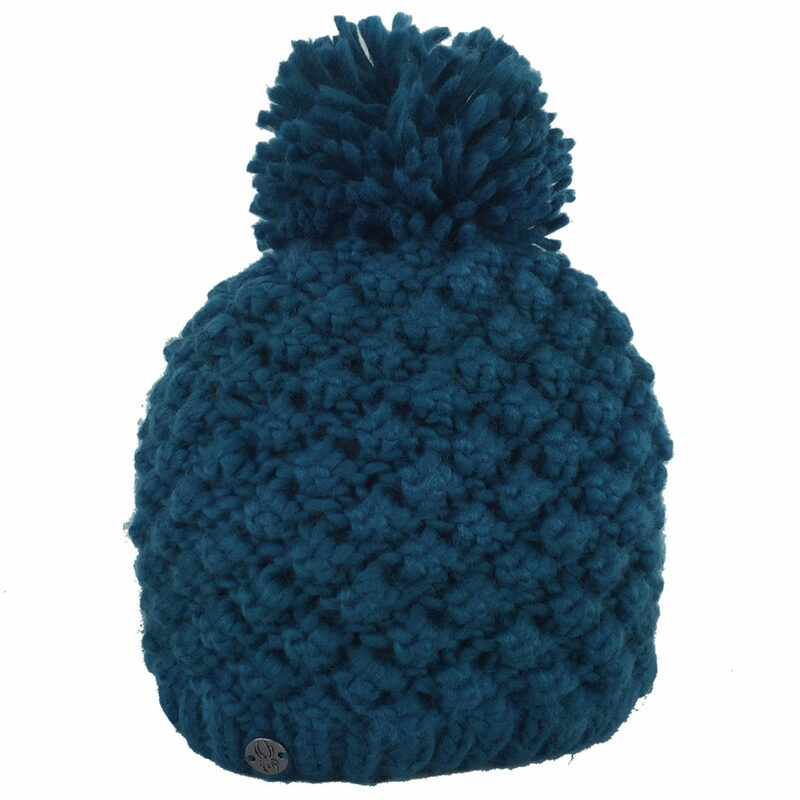 Keep their ears warm and the smile large with the BRRR Berry hat this Christmas. 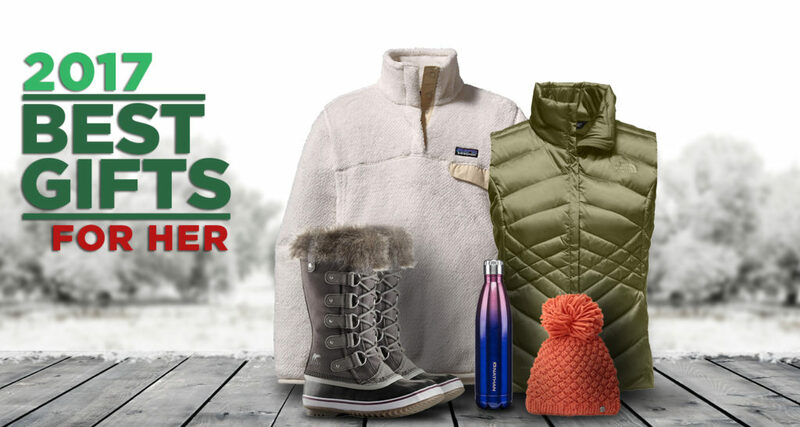 Our final pick for our suggested gifts for her is simple in concept. The Nathan’s Chroma Steel water bottle is exactly as it sounds. A steel water bottle that keeps your hot drinks warm and cold drinks cool. Perfect for the office, home, or on the go. But the Ombre color styling on the outside lets her know you picked it out just for her. Great for that last gift for the stocking, or even an additional gift if you aren’t sure the first one is good enough. Whatever the situation may be, the Nathan’s Chroma Steel Water Bottle is never a bad solution. This time of year, you are probably already being hit with a wave of holiday decorations, Christmas music, and seasonal sales. And while the last of the Halloween candy may not be eaten, many of us are already shopping for the perfect gift. We aren’t sure what this year’s hottest gift will be, but we’ve got a pretty good idea what will make any guy smile on the morning of the 25th. We’ve gathered some of this year’s coolest gear, in an effort to help you sift through endless advertisements and keep you out of the crowds on the morning of Black Friday. With a wide range of sporting goods and apparel, there’s little doubt that there is something for every guy here. Anyone who’s active these days seems to have roller laying around the house or gym. But what you’ll quickly discover is that this isn’t your typical piece of cylindrical foam. The Hyperice Vyper 2.0 is the next generation in muscle recovery, which is why it’s trusted by professional athletes across the globe. 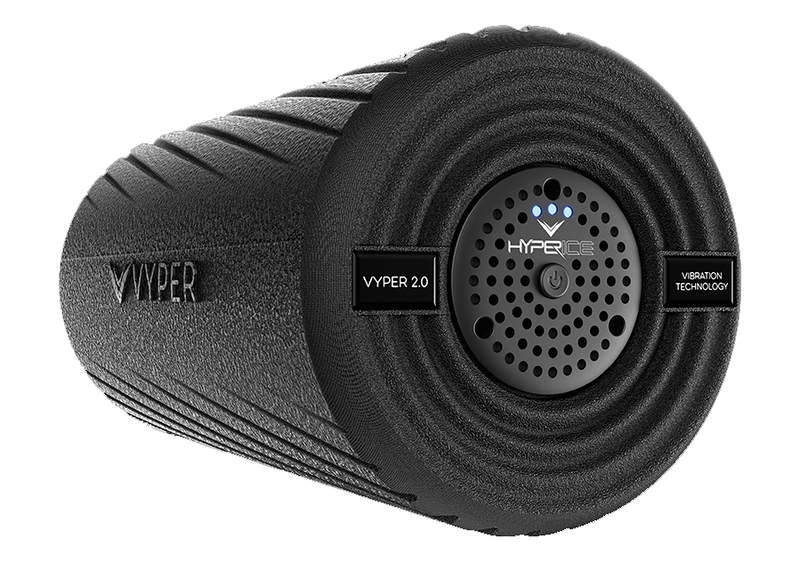 The Vyper 2.0 provides three speeds of high intensity vibration which make it twice as effective at helping you warm up, activate, and recover. You can use this new piece of fitness technology to improve your flexibility and circulation, while also reducing soreness and stiffness. Complete with a rechargeable battery that lasts over two hours, you can be sure any active guy would love this addition to their workout routine. 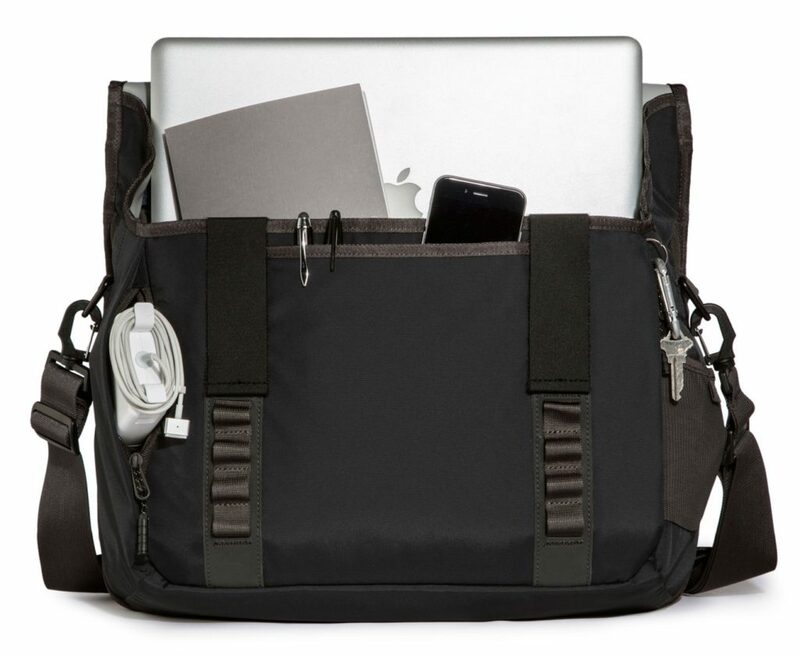 Sleek and chalked full of thoughtful features, the Command Messenger Bag from Timbuk2 is a must have for any guy on the go. With seemingly an endless number of pockets, organized storage is at a premium. Quick entry storage is obtained through it Napoleon side-entry pockets (think of any portrait painting of Napoleon) allowing you to get to things on the move without the hassle of undoing the flap. You’ve also got a zipper secured lap top and tablet pocket on the back, which keeps your most valuable items safe and close by. The list of features seems to go on and on, but what you can know for sure is that this bag was meticulously designed to meet the demands of any situation. You may be hesitant to pick up any gift with the word “sweater” in it. But if you haven’t owned a Better Sweater from Patagonia, you truly are missing out on one of life’s joys. This is not a new product for 2017, but there is a reason it continues to be a best seller. The outside is sweater-knit polyester, which feels as good as it looks. The inside is lined with a soft fleece that keeps you warmer than you could have imagined. The ¼ zip version of the Better Sweater is notably popular for its versatility. Fashionable enough to be worn on a night out and durable enough to survive a relentless winter. “Man, I’m really disappointed with this Better Sweater” – No Guy Ever. Many will spend the holidays dealing with cold conditions, and what could be better than the gift of warmth. Not quite a trip to the Caribbean, but the Vinson Heated Vest from Mobile Warming will certainly keep any guy a lot warmer this winter. Originally designed for the outdoor enthusiast, its water resistant outer shell is ideal for hiking, skiing, and hunting. 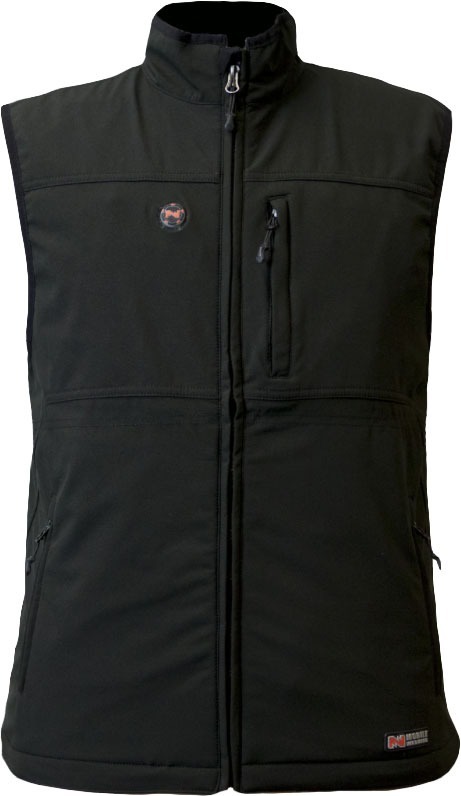 This heated vest can be worn under a jacket for extra warmth, or all on its own. Its simple push button operation allows you to easily change the temperature settings, and has the power to reach up to 135 degrees Fahrenheit. The 7.4V lithium-ion battery last up to six hours, meaning you can carry comfort around with you. Perhaps not the flashiest gift this Christmas, but a few hours into some cold weather exposure, and there surely isn’t anything they would be more thankful for. 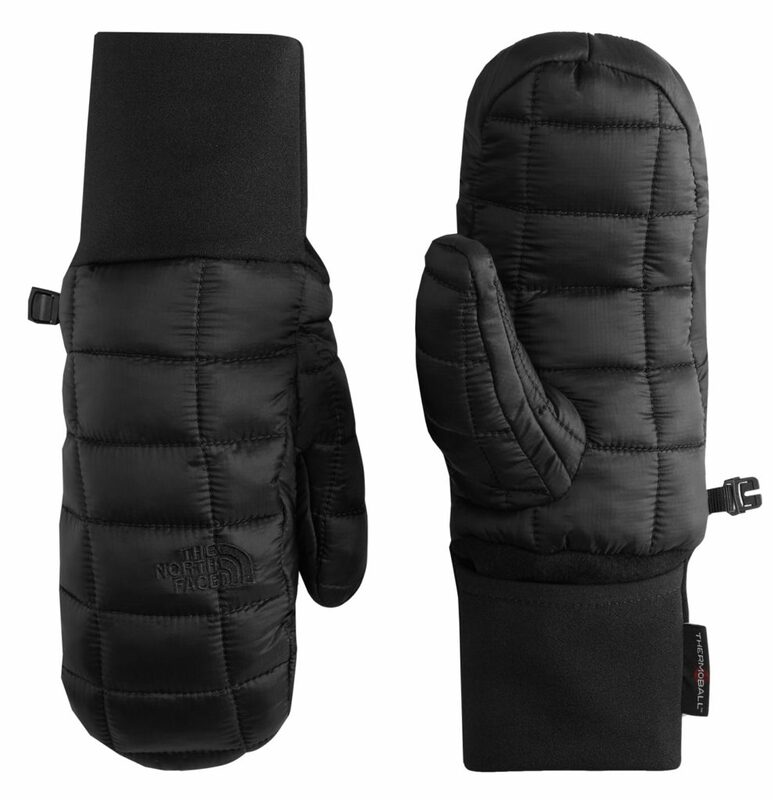 Coming from The North Face, you know these Thermoball Mitts are all business when it comes to keeping you warm. Using the same features from their popular Thermoball Jackets, The North Face has repurposed this versatile warmth to cover the first thing that seems to get cold, your hands. Using clustered PrimaLoft synthetic insulation, you get the warmth of down but the improved performance in wet conditions. The synthetic material dries out quickly, meaning you’re back on the go in no time. Packs easily into a stowpocket (or stocking), making it a great little gift for any guy, big or small. Athletes everywhere are always looking for a way to gain that extra inch, half second, or mile per hour that will change their game. Across all forms of athletics, sports training aids have been a way for competitors to increase strength and improve form through repetition. One of the more common types of training aids is a resistance device using weights or weighted equipment. We have all seen the baseball bat weighted ring, a weighted basketball, or one of the countless golf training tools. But what these all have in common is that they are sport specific. Younger athletes are often involved in a multitude of activities, playing different sports every season of the year. This has meant you were buying different training aids for different sports, filling your garage up with gadgets that were going to get your son or daughter a full ride. One company addressed this issue and designed a weighted training aid that work for a variety of sports like never before. This company was LaceUp, and their idea was the Training Lace. 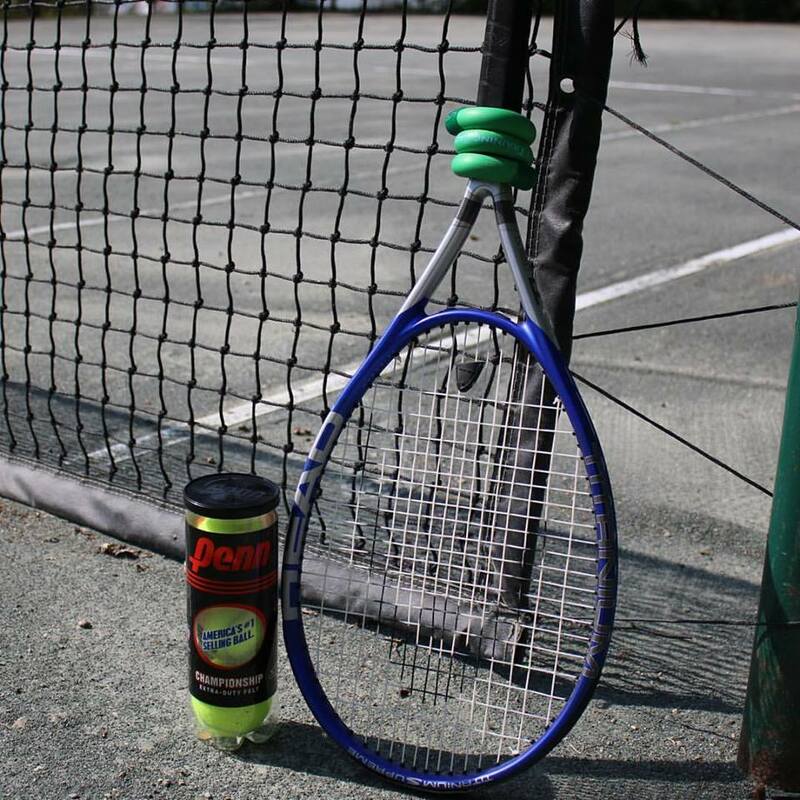 This bendable, weighted “Lace” allows you to add weight to your bat, stick, wrist, racket, and more! Available in several different weights, the Training Lace is making an impact across the sports spectrum. Originally designed as a weight for a lacrosse stick, the Training Lace has become more dynamic than was originally thought. 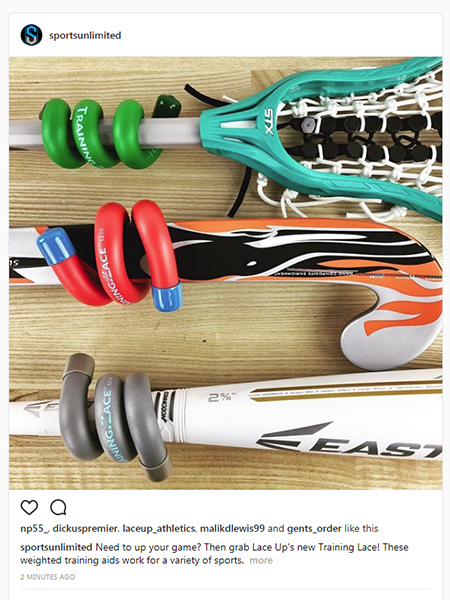 Now it is being worn by basketball players and swimmers on their wrists, tennis players on their rackets, baseball and softball players on their bats, as well as ice and field hockey players on their sticks. The list seems to be continuously growing, and new ways to use this little device are being developed every day. What makes the Training Lace so valuable beyond its versatility is its adjustability. Specifically looking at it as a baseball training aid, this bat weight is different than your traditional ring. Unlike other baseball bat weights, the Training Lace does not move on contact, thus keeping the swing smooth which allows you to maintain form. The other unique feature is that you can move the weighted lace to different areas of the bat to focus on specific parts of the swing. Put the Lace on the middle of the bat to target bat path and plane. Move it down towards the handle to work on getting the “knob to the ball” and preventing you from letting your hands lag or drag. Using the Training Lace in batting practice or the cages can lead you to see an immediate improvement in your swing. 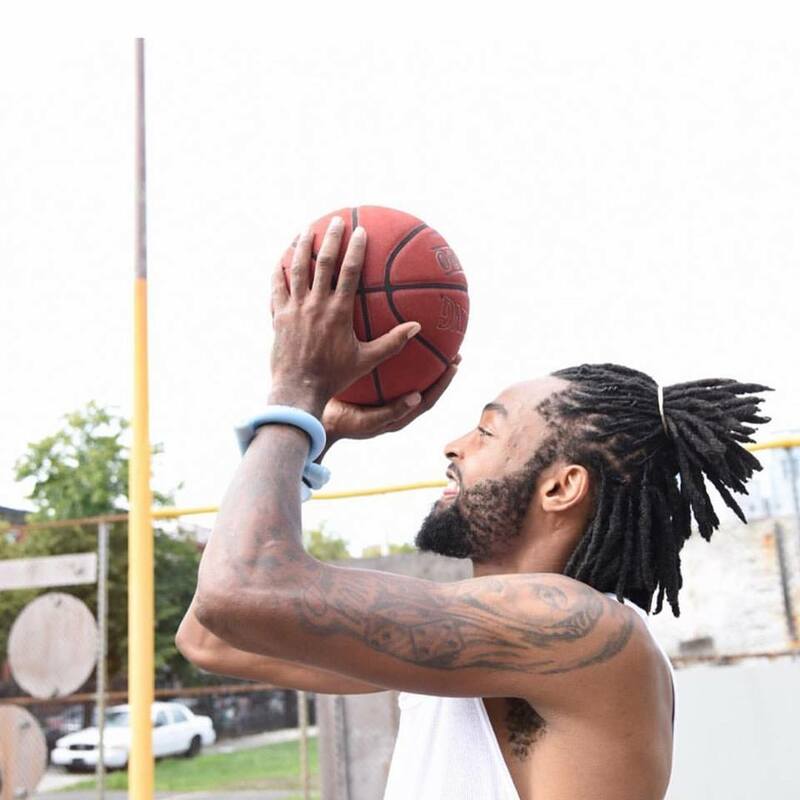 LaceUp has designed a product that truly can benefit athletes everywhere. From youth sports to the professional level, the Training Lace develops strength that will enhance performance. Lace up your training regime with the Training Lace today. The football community has been anxiously awaiting the newest unveiling from helmet manufacturer Schutt. It’s been years of research, development, and prototypes, but the time has come. Worn by the best professional and collegiate players, and now available for purchase, is the innovative Schutt F7 football helmet. Using the most advanced impact absorption system on the football field, the F7 is a revolutionary new level of protection. 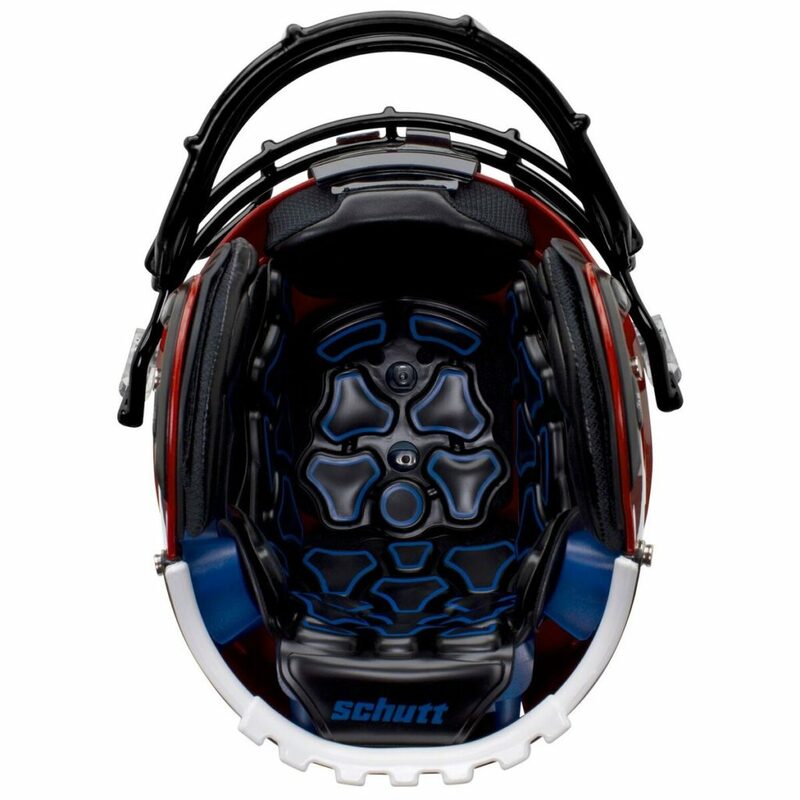 When first seeing the new F7, the most apparent and important new design feature is the Schutt Tektonic Plates. 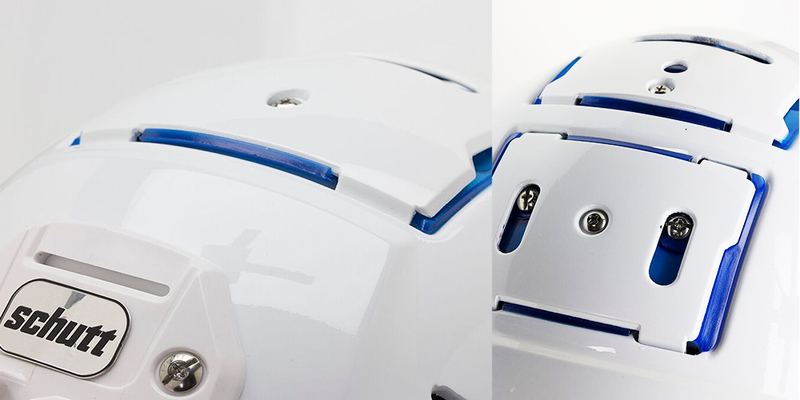 These separated panels of poly-carbonate, with TPU cushion below, are specifically placed in the areas of the helmet most susceptible to big collisions. Adding these independently moving external layers allows the helmet to better absorb the impacts experience on the field, and improves the helmets performance against rotational forces. One staple in the Schutt football helmets is their use of TPU Cushioning. Proven as an elite absorption material in any climate, the new F7 football helmet is loaded with. Featuring TPU in the Tektonic plates, the lining of the inside, and a newly design front pad. Developed to provide the same level of protection hit after hit, throughout a long season. 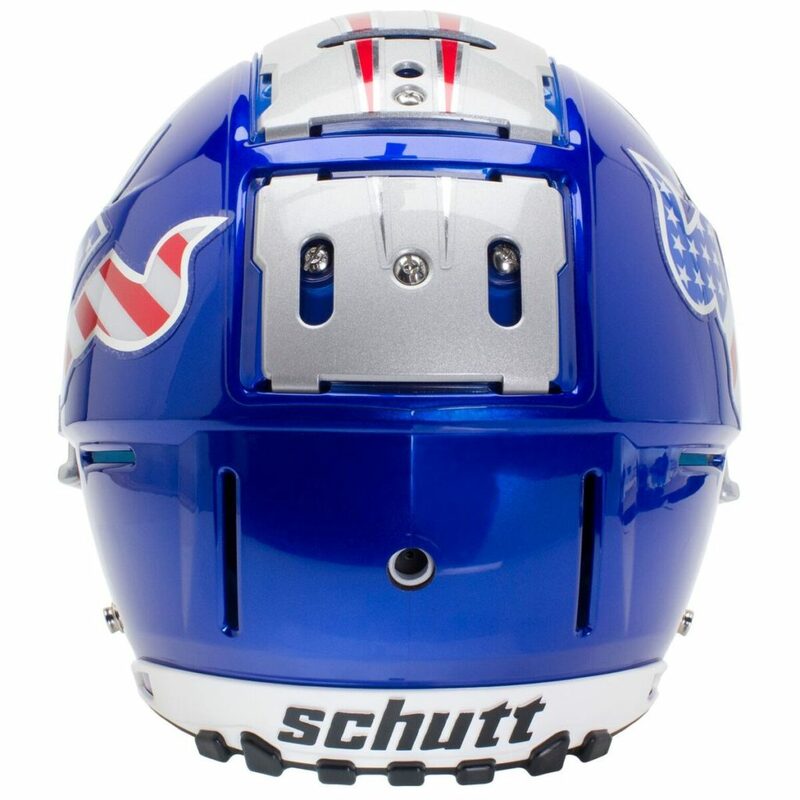 A feature found in several of the new football helmets from Schutt is their Helmet Stabilization System (HSS). A large jaw pad configuration that frames the face delivers a more secure fit. Constructed from impact foam wrapped in fireman leather, the helmet is more comfortable than ever. Also part of the HSS design are the stabilizers on the inside and outside of the helmet, which provide strength and durability. Just like a luxury car, the features on this seem to be endless. Titanium facemask make it 60% lighter and extremely durable. Rapid Release quarter turn hardware let you take the facemask on and off quickly. The SUREFIT Air Liner allows you to easily adjust the helmets fit with the addition or subtraction of air. All of this is found on the most advance helmet shell ever produced by Schutt. Engineered Flexural Resistance in the back shelf and temporal wings allow the TPU Cushioning below the surface to perform at its best. 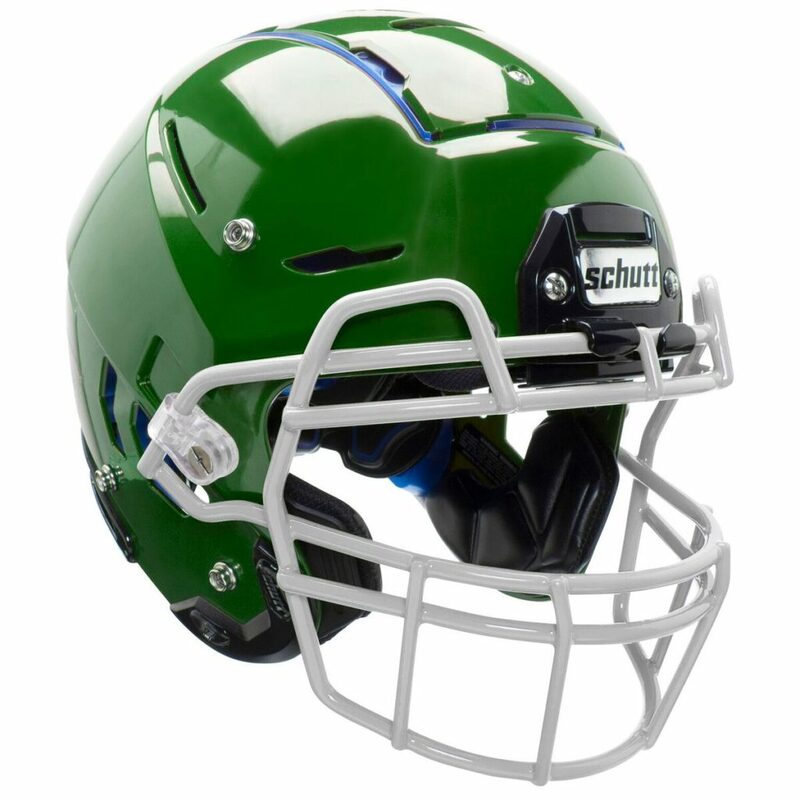 While the impacts on the football field are still momentous, and the repercussions significant, the Schutt F7 is an step in the right direction in making the game we love safer. It will take more creative thinking, like that which went into the designs of the F7, that will continue to push the advancement of protection for football players everywhere. Most of those involved in youth baseball have had the date of September 1st, 2017 circled on their calendar for some time now. That is because this will be the first day you can buy a new USA Baseball certified bat, which will be the requirement for a large majority of the youth leagues come January 1st, 2018. This is part of a campaign that was designed to create “wood-like” performance standard in hopes of preserving long term integrity of the sport. Bat manufacturers have spent the last two years redesigning their bats to meet the new certification standards, and will begin selling them this coming Friday. This does not affect those participation in leagues or travel clubs under USSSA (United States Specialty Sports Association). 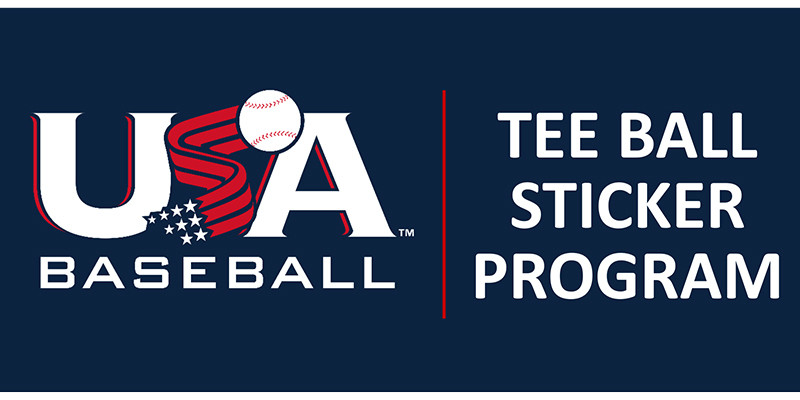 Tee ball play will be impacted as well, but will allow more leniency as a certification sticker program that lets players to continue to use their current bats will be available. So what is changing? With these new certifications comes a new standard of performance. Currently, the required Bat Performance Factor (BPF) was at 1.15. The new standard will be lower to replicate that of wooden bat. In a separate but comparable rating system, the performance testing used on NCAA/NFHS bats sets a limit at .500 BBCOR. 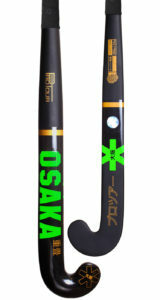 The new USABats will be at .530 on that same BBCOR scale. Other changes will be that players in these leagues are now able to use the larger 2-5/8” barrels, and no drop weight limit means younger players can still use bats made from lightweight materials. Some of that may seem a bit technical, but the gist is that the new standards will translate to a similar performance of a natural wooden bat. The good part of this process is that the bat manufacturers have done all the hard work. Companies like Easton and Rawlings have been tirelessly working to deliver the same reliability in the batter’s box that many players call on. As of Friday, you will get a look at their latest lab creations and see what they’ve cooked up for 2018. 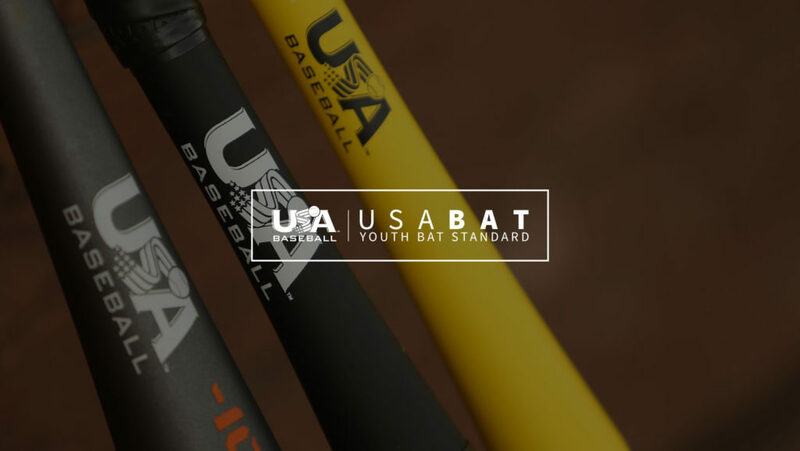 All you’ll have to be sure of is that the bats have the USABat certification stamp seen below. You can also be sure that Sports Unlimited will have the best youth baseball bats for 2018 in stock and ready for same-day shipping. Check them out for all your baseball equipment needs for next season. Since last October, SportsUnlimited.com has been operating on a brand new platform. After years of designing and developing their new website, the ecommerce sporting goods retailer has looked to provide its customers with an unrivaled shopping experience. As part of this process, new features have been added in throughout the last year, all aimed ti and give consumers more options. Their latest unveiling has been well received, and allows Sports Unlimited to do what they do best (football) in a whole new way. If you were searching for some new football equipment, then Sports Unlimited was probably already on your radar. As the largest online football store, they stock more helmets, shoulder pads, and training equipment than any other football retailer. What that has meant for football players, coaches, and parents alike, is that they can get the gear the need shipped out same day. With more and more players and parents wanting control of the gear they wear on the field, having quick and easy access to the safest helmets and pads on the market has been essential. This August, Sports Unlimited took that quick football service a step further, rolling out their Custom Football Helmet builder. 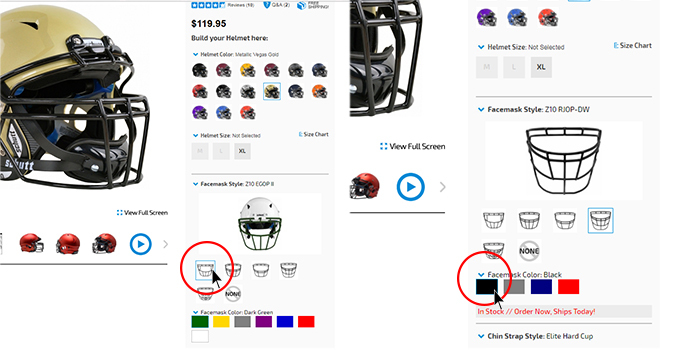 Now you not only have the ability to choose from Riddell and Schutt’s latest helmets, but you can also select the facemask, chinstrap, and colors of each. This new customizable football helmet experience is made possible by two contributing factors. Sports Unlimited’s extensive stocks of helmets and accessories, and a step by step selection process. 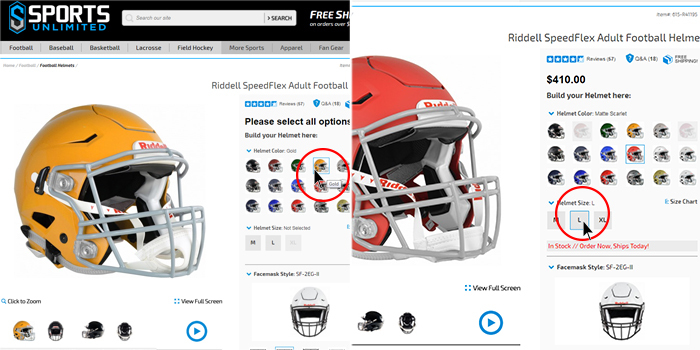 To take advantage of this new feature offered by Sports Unlimited, simply visit the website (www.SportsUnlimited.com) and select your favorite Riddell or Schutt Helmet. On the right hand side of the page, you’ll find all your customizable options. Firstly, you’ll want to select this and color of your helmet. The large picture of the helmet will reflect the change in colors, as you select from an assortment of options. Next you’ll get to decide which facemask style you want, along with its color. This process used to be complicated and time consuming, as certain helmets require specific facemasks. But Sports Unlimited has done the hard work here and separated the options that will work for your helmet. Choosing a facemask is also important, as different positions prefer different styles. Wide Receivers and Quarterbacks want more open masks so they can see the field. Linemen on both sides of the ball want larger more protective mask to prevent injuries when they are battling in the trenches. 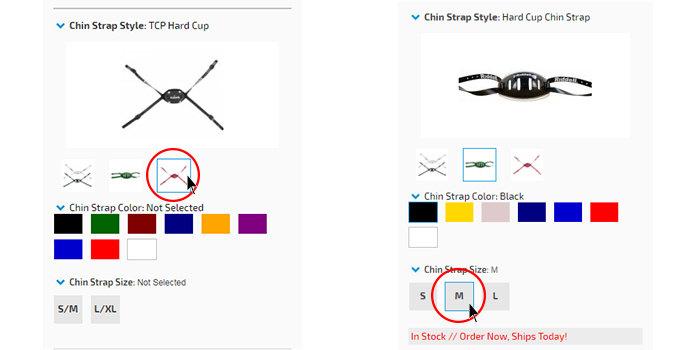 Simply select the style and the colors available will populate. Choosing your Football chinstrap is done the same way as the helmet and face. 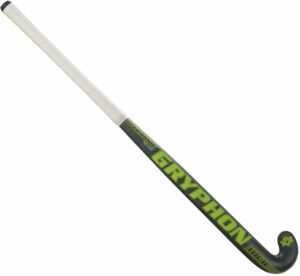 Choose from the traditional soft shell or select hard cup protection in a range of colors and sizes. 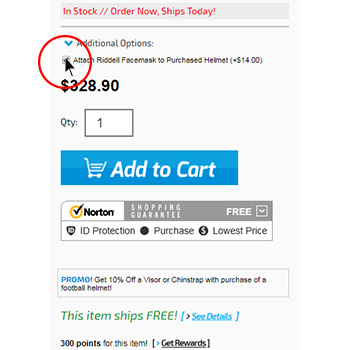 The final step in the custom football helmet construction is a facemask attachment option. This allow you decide if you would like one of the professionals at Sports Unlimited to attach your new facemask to the helmet. 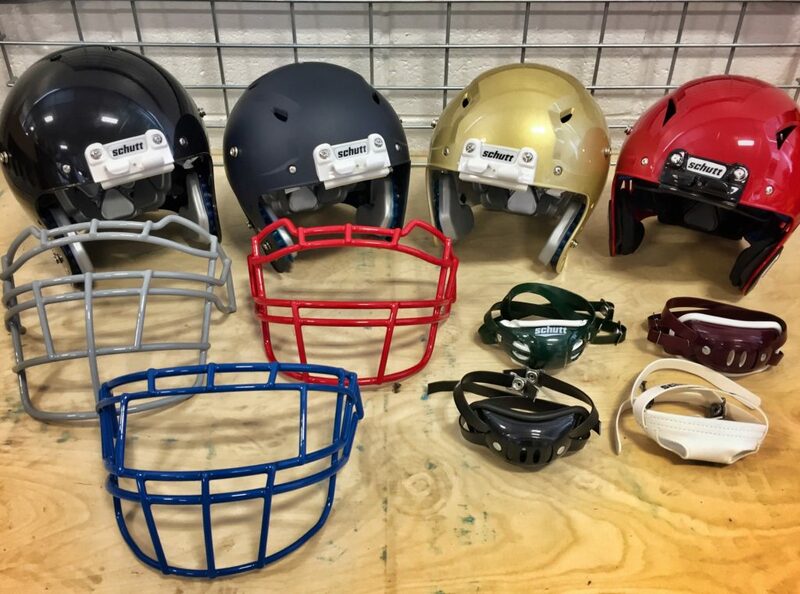 Sports Unlimited won’t be the first retailer to offer helmets and facemasks in different colors, but their large selection and fast same-day shipping make it tough to beat. Whether you shopping on a desktop, tablet, or mobile phone, this process is simple and easy to understand. 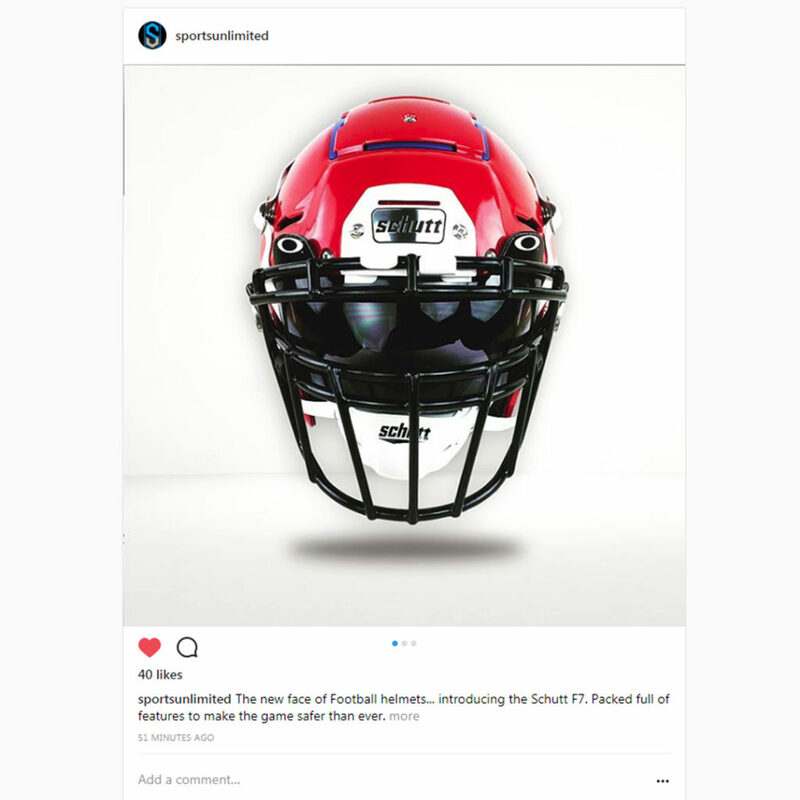 As parents and players gear up for this upcoming football season, be sure to check out the new custom football helmet designer at Sports Unlimited. Preseason football is back, college camps are grinding it out, and football season is so close we can almost taste it. As we approach the final few weeks of summer and the imminent first games, we take one last look at some of the 2017 football equipment being used this fall. 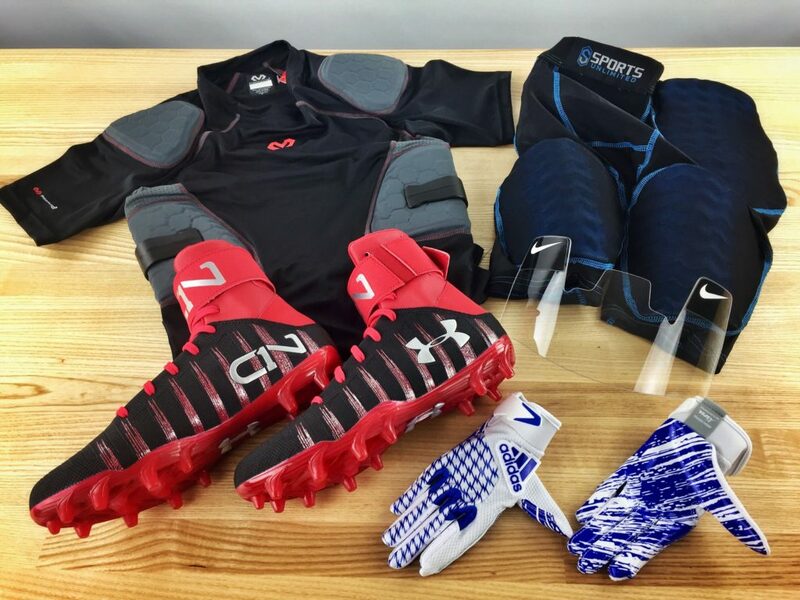 Our concluding football equipment review looks at some of the gear the senior level players will be wearing to elevate their performance. The ability to run faster, catch better, and recover quicker are features that elite level players are looking for. Any edge that can be obtained could be the difference between a win and a loss, a playoff spot, or a championship season. The Under Armour Spotlight football cleat can be described in two words, speed and style. This lightweight, low cut football cleat is a serious show stopper. When you are competing at this level, the most important characteristics are fit and feel. Under Armour has delivered on these fronts with several design features like the SpeedForm construction, a Pedax external heel counter, and a seamless molded heel cup all help lock this cleat to your foot. This allows you to cut and pivot with confidence, and change direction on a dime. On the outside, and Icy Diamond synthetic upper puts you in the “spotlight”, while the chrome TPU cleat plate lets the opposition see their reflection as you speed past them. As Under Armour brand ambassador Deion Sanders once said, “look good, feel good. Feel good, play good. Play good, they pay good.” The Spotlight football cleats from Under Armour will have them adding zeros to the conversation. While looking good on the football field maybe important, protection is essential. The higher the level of play, that hard the hits you’ll take. That is why any extra padding can keep players on the field and off the IR. The newly designed 5-Pad Protective Shirt from Sports Unlimited is just what you’ll need to handle the rigors of a long season. Perforated foam padding helps shield the ribs, spine, and shoulders from big impacts. Flexible and covered in a breathable mesh, the pads won’t restrict player mobility. The compression fit shirt works great underneath the shoulder pads, and keeps the extra padding in its place. Available in both black and white, the Sports Unlimited 5 Pad Protective Shirt is worth adding to your game day collision defense. 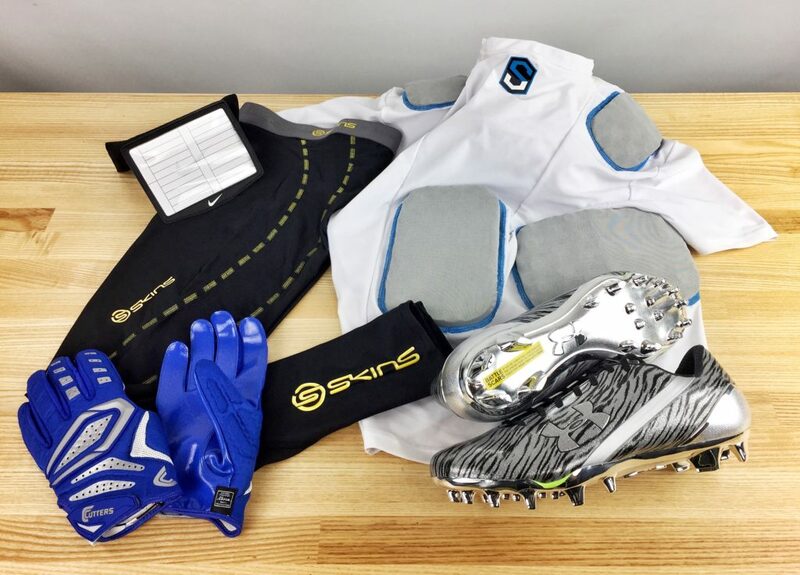 Athletes in all sports have begun to discover the importance of compression apparel. From increased performance to improved recovery, compression gear can really be the difference maker for an elite athlete. Australian based company SKINS have been focusing on the impact of compression gear on athlete’s performance since 1996. Now developing over 160 products sold in 31 countries, their importance can no longer be ignored. The DNAmic Men’s Compression Tights is a staple product of the SKINS brand, offering several crucial benefits to players performance. The Dynamic Gradient Compression provides the support and stability muscles need for proper oxygenation which helps reduce the buildup of lactate acid. Wearing the compression gear post workout or competition also helps improve recovery speeds by increasing blood flow. Complete with moisture wicking fabrics to keep you cool under pressure, the SKINS DNAmic Men’s Compression Tights can become a real asset to a serious athlete’s performance. Sticking with the importance of compression, we look at what Nike has delivered with their Pro Combat Dri-Fit Playcoach. Wrist coaches have become so important as the game continues to speed up. Offenses are now snapping the ball at an accelerated rate to keep the pace up and tire out the defense. Players on both sides of the ball rely on the wrist coach to quickly get the play call, so they can begin to interpret what’s in front of them. 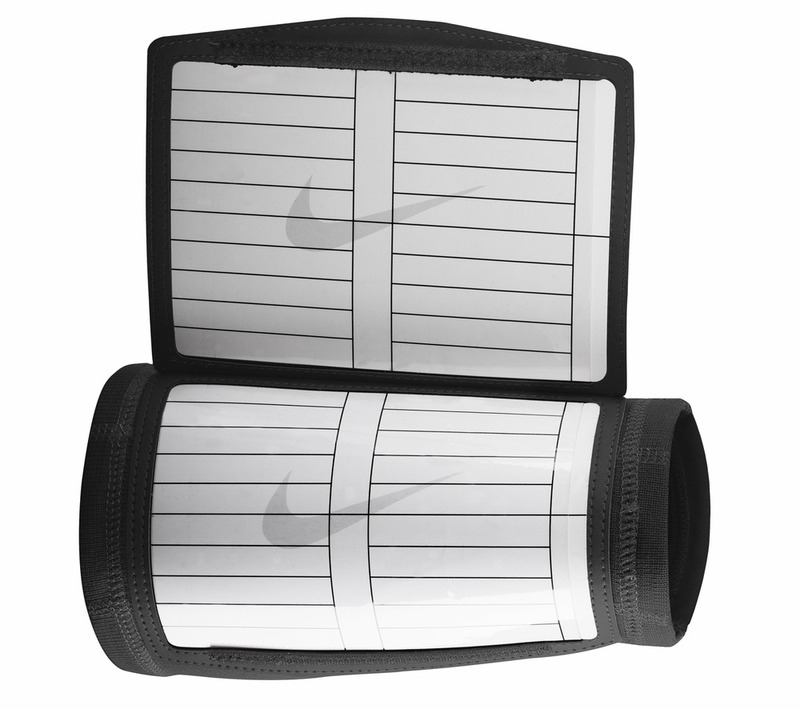 The Nike wrist coach allows players to clearly read plays with it larger windows, and stays in place when the need it to. Using the compression Dri-fit fabric, the playcoach doesn’t slide on the arm like other knit based products, allowing players to focus on what’s important. It also features a built in belt loop for those who prefer it on their waist. Step to the line of scrimmage with confidence with the Pro Combat Dri-Fit Playcoach. Every player on the field wants to have the confidence in themselves that they’ll make the big play when the opportunity arises. One way to build that confidence is to give your hands some added grip to make that catch, intercept that pass, or scoop up that fumble. 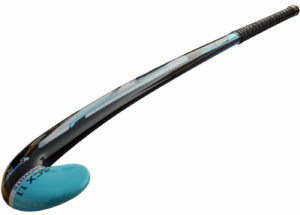 The S651 Gamer 2.0 from Cutters is just what your hands have been looking for. 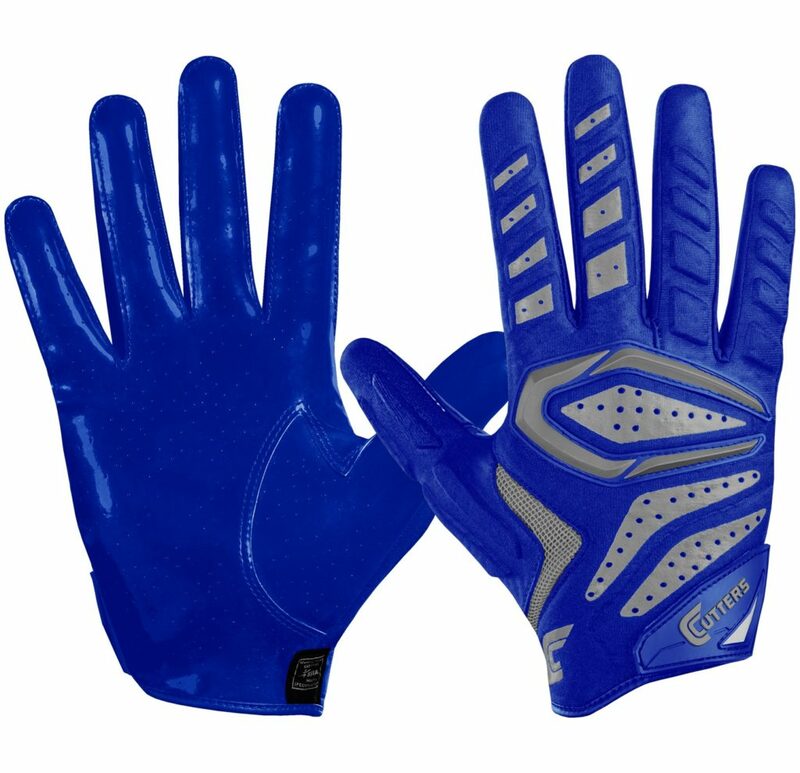 Recently redesigned, these perfect all-around option providing the grip of a receiver glove, with some added flexible padding for protection. Featuring Cutters patented C-Tack, these gloves perform well in any weather you might see. Lightweight, yet durable, these versatile gloves are a real game changer. August is just a few days and away, and football season is even that much closer. Final preparations are being made before camp, as teams and players look to be ready to hit the ground running at the sound of the first whistle. Part two of our 2017 Youth Football Equipment Review takes a look at some of the other gear you might decide to upgrade before the season starts. We covered the essential protection in part one with the helmet, shoulder pads, back plate, and rib protector. But we’ll turn our attention to base layers protection, footwear, and other accessories for this installment. While some of these items may not be as important when it comes to protecting a players, they can be the difference maker when it comes to performance. As one of the most popular items in the Sports Unlimited football apparel line, the integrated football girdle has been redesigned and taken to a new level for 2017. The use of an integrated girdle has become a staple in most football player’s equipment bags. 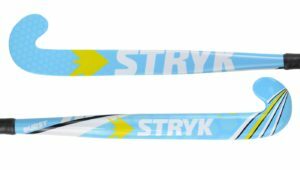 A newly added lightweight foam with zig-zag pattern has improved the range of motion without sacrificing any protection. 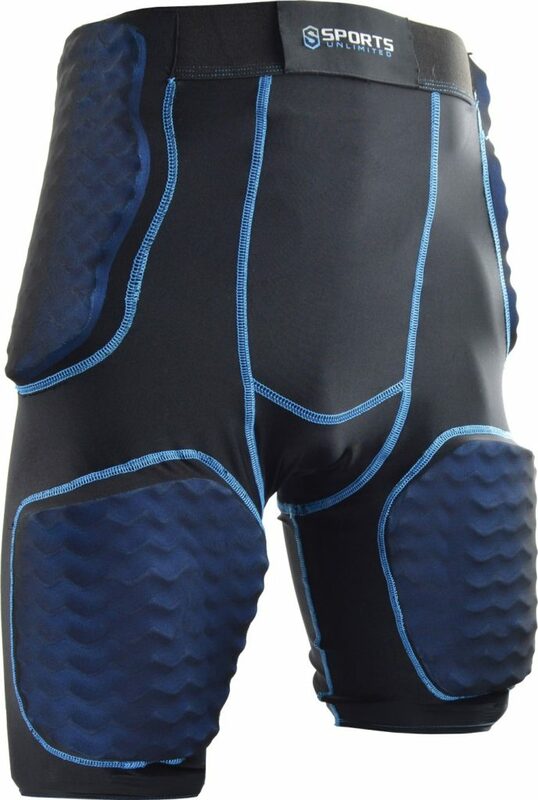 Complete coverage is offered with its 5-Pad system, shielding the hips, thighs, and tailbones from heavy impacts. Its compression fit keeps the pads in place, making sure they are in the right place at the right time. The SU girdle also comes with a pocket for a cup if you wanted to add some extra protection. Works great for youth football, including flag football players that want some addition protection on the field. Known for making gear that protects better than the rest, the Rival Pro 5-Pad Integrated Shirt from McDavid follows their long tradition. This protective under shirt allows players at any position to give themselves some additional protection, without limiting their mobility. 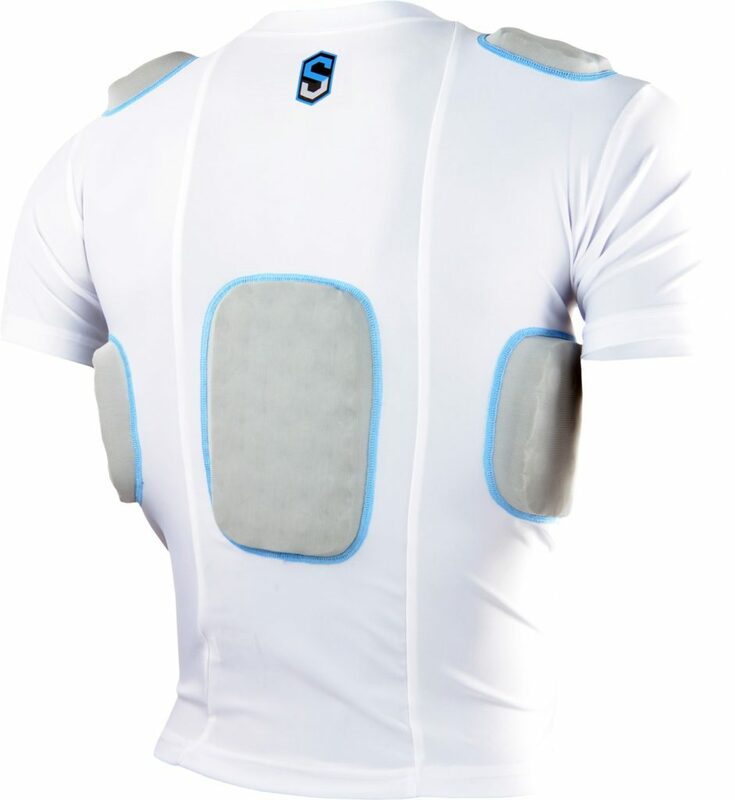 Its 5-Pads cover the area most susceptible to hits, including the shoulders, spine, and ribs. Made from EVA foam, the Flex Air padding was designed with multi-directional vented flex channels for increase air flow to keep you cool. The bio-shape design and compression fit keep the pads in place underneath the shoulder pads. 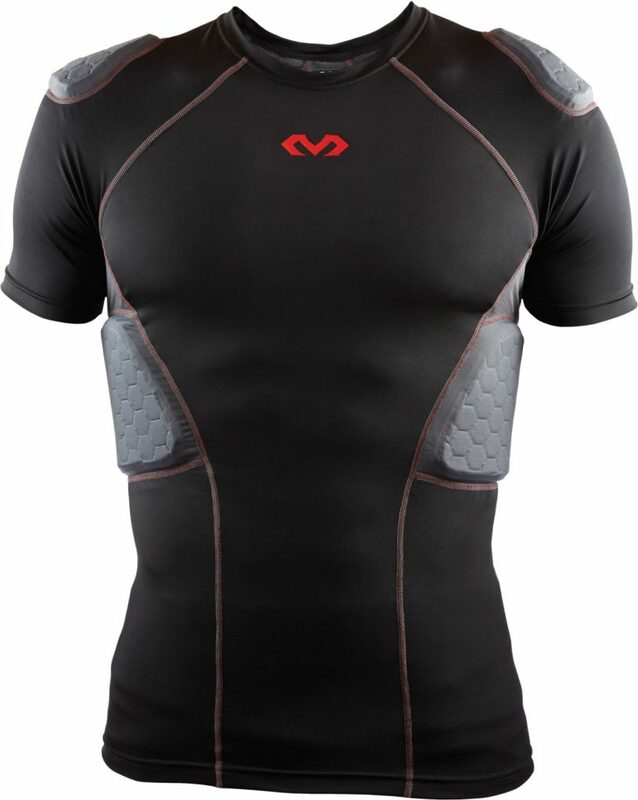 The McDavid Rival Pro Padded Shirt makes for a reliable inclusion to any players game day gear. Few players in the game can perform as well as Cam Newton does in the spotlight. 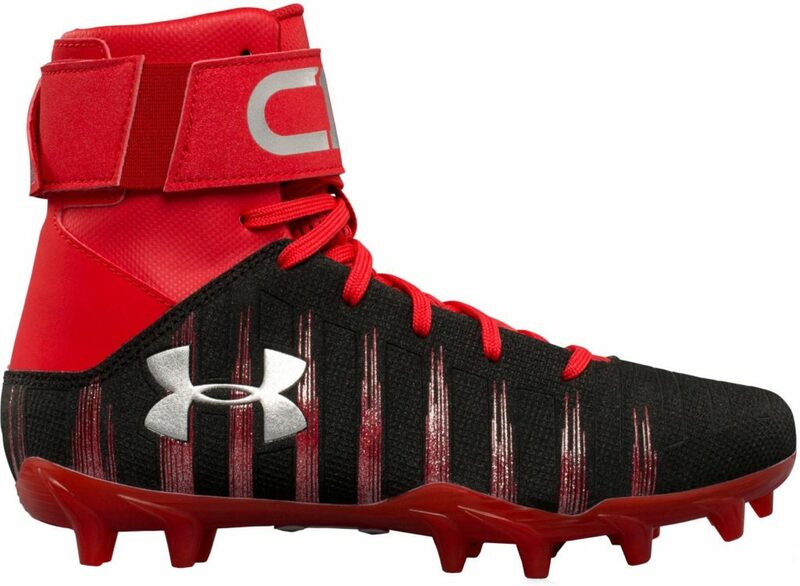 But thanks to Under Armour, you can get off on the right foot by lacing up his signature cleats, the C1N MC Jr. These youth football cleats let every player feel like they can take on anything that comes at them on the football field. A mold cleat base provides great traction when making turns and cuts. A compression fit sleeve makes these feel light on your feet, and the reinforced upper offers support and breathability. Have your future star stand out with the new Under Armour Cam Newton youth football cleats. Build catching confidence from the first practice with the Adidas Adifast 2.0 youth receiver gloves. Designed to make bringing in the ball easier than ever, the scaled down version of the professional gloves give every youth football player an advantage. The palm features the exclusive Adidas GRIPTACK design that help you make the tough catches in any weather. A compression fit is achieved with the a Honeycomb thumb and molded rubber tab, keeping the glove secure and in place. 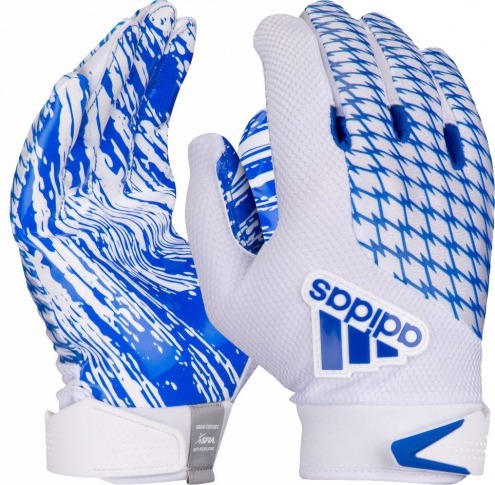 Stand out on the field with both style and performance with the Adidas Adifast 2.0 football gloves. No piece of equipment has seen its popularity grow over the years more than the football visor. It seems more players have visors every year, and youth football is no exception. While the style can be appreciated by most, the additional protection cannot be denied. 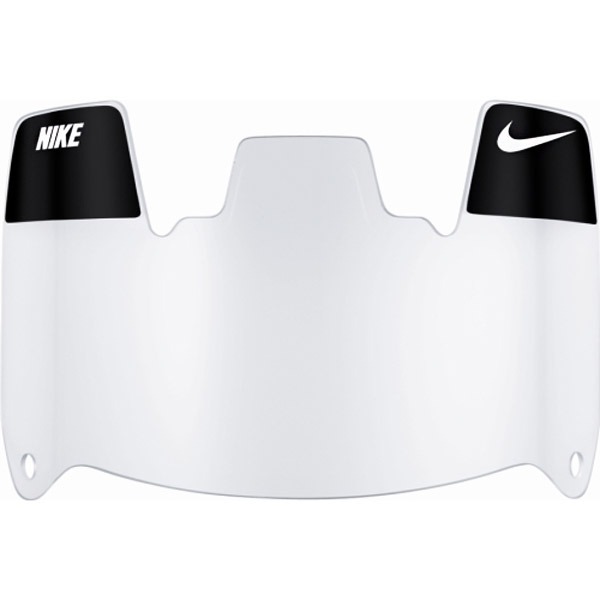 The Nike Gridiron Eyeshield provides players an extra layer of defense from the perils of tackle football. The Nike Max Optics design features a wrapped lens that reduces distortion, giving you a clear view in every direction. The curved shape allows it to fit most helmets, and its polycarbonate construction is scratch and shatter resistant. See the game better than ever with the Nike Gridiron football visor.